According to this fine article, "[t]he Department of Commerce estimates the mall will provide approximately 30,000 jobs in the coming year." Plus, it might give me a reason to stop in Alice once in a while to buy some of those fine Pottery Barn products! I do wonder, however, how this compares to the previous Onion article North Dakota Found To Be Harboring Nuclear Missiles. It must not be significant enough, or there's advantage in protecting our Ben Franklins and Blockbuster Videos. Well, completely willingly, and I'd hoped they would have done it long before. The stability of a paycheck was too good to quit on my own, but I knew they were not happy with me, I was very unhappy with them, so it was only a matter of time. At the slightest inkling that last Wednesday's meeting was about separation of employment, I got excited. Do you know what it's like to hate everything about your day? It was just barely worth $12/hr, but I can do that on my own; better than that, actually. So, my freelance work that's been here-and-there for the past four years is now permanently here. My target is to work from home, full-time, doing the things I love: creating websites, fixing computers, selling on eBay, and whatever else strikes my fancy. The risk is that, while I have plenty of product and services available, I need customers. I had enough customers to make it well worth a couple hours each night, but now I've got to fill 8 hours every day with freelance work to make it profitable. That means I need to triple my customers...I'l a'workin on it. I've got a number of family members who were/are also small-business owners and entrepeneurs. Their experiences have been some good, some bad, and I hope I can avoid the 'bad' parts. Nice thing is, they're a good resource for learning how to avoiding mistakes and pitfalls. I'd like to stay away from those -- pitfalls are no good for anyone. Holy Schamoley! I'm in the Fargo Forum yet again for my web-based stuff! On the front page, no less -- they don't mention me by name, but a link to this site is shown and quotes my 11 February post. I was interviewed for a blog article last spring, but nothing came of it, and now I'm linked and quoted without warning...it's very interesting. Wait -- "again", you say? If you read my rarely-updated About page, you'll see 11111001111 (the REAL title of this blog) is binary for 1999, the year I started this blog...the old format blog is now gone (with longer entries), but the name remains. In the past 5 years (aside from my WalMart Receipt craziness and the MPR show) 11111001111 was featured in an article by A∴ B∴ in 2002. 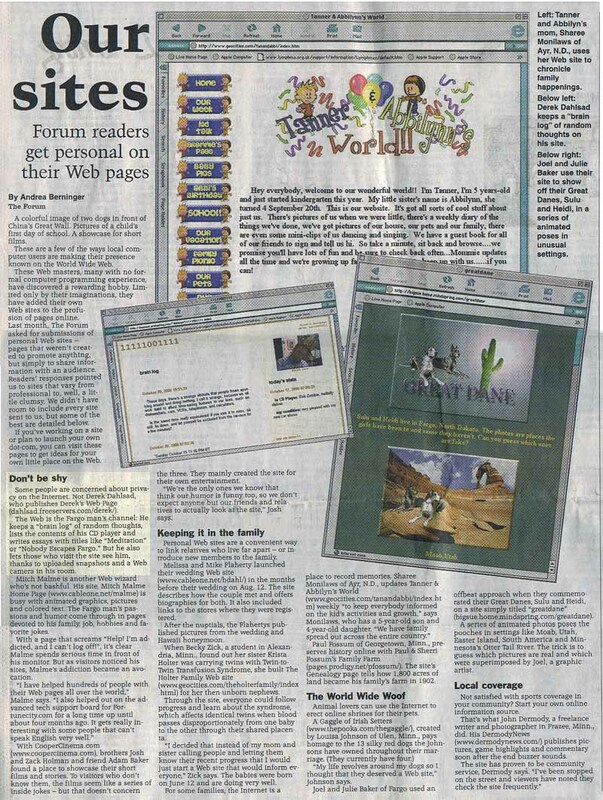 At that time, 'blogs were a rare and new thing, and I don't use the word 'blog' in my site mostly because it wasn't really a word back in 1999. The older article was featuring personal websites, and mine was unique because I updated content regularly, more like a journal than simply a website. Was I the first blog ever featured in the Fargo Forum? Could be! Hello all -- as usual, I'm getting into the game late, but I need a little bit of generosity from you, faithful reader! This Friday, I'm participating in Big Brothers - Big Sisters Bowl for Kids' Sake. For the past few years Lincoln Mutual has put together a team, and I'm on again this year. So, friendly netizen, please send a donation. It needn't be large, but minimum $5 please. All money will go to Big Brothers Big Sisters, and it's matched 50% by my employer -- so you'll be doing even better than you thought. Thanks all who donated -- I had to turn in my donation sheet to get my employer's match. All together I raised $142.50, most coming from you online users. Thanks! Raw materials are great -- they're not really anything until you make them become something, and that 'something' can be a lot of things. I bought a bunch of raw materials last weekend, and this weekend I have to take a truck and go pick up the purchase. A load of iron ore, twenty-six thousands ton more than the Edmund Fitzgerald weighed empty? Not quite...there's an antique shoppe in Milwaukee (Hales Corners, actually) who cleaned out a printshop. In his warehouse sits dozens of boxes of old printing cuts for advertisments, business documents, product labels, and books. I've bought the whole lot. When you spend a couple hours trying to sift through all the boxes, picking out the best plates, it's a reasonable conclusion. "Let's ask what he'll take for the whole thing," she says. What he took for the whole thing was still in our budget, and we'll have plenty of time to find the best ones on our own time. What do we intend to do with our raw materials? Many will be sold to collectors. Some (after some edumacation for me) will be used to make new prints, to be sold much like a lithograph. Many will become clipart for my websites and upcoming print endeavors. Others are just so cool that they will be converted into t-shirt images, to be sold online. While the price was higher than our usual purchase limit (he wants payment in cash, and there's a stack of hundreds waiting on my dresser; I best not forget to bring them with), I'm certain we can find something much more valuable in our half-ton of raw materials.